The idea to have your own software product is business is compelling but not every developer is ready to make this step. Often they have families supports, loans or mortgages to pay, etc., so they cannot drop their current job immediately because they need the money. Fortunately it is not mandatory to drop your current job to start your own software product business. The video below gives you one simple tip that can help you to start your own business while keeping your current job. 2. Do not seek investment initially. Be patient. Develop your product as your time permits until you have a working prototype. 3. Insight 3: Develop a little bit of your product every day. Avoid wasting time on things that you really do not need. The next video will about a method for creating software products that will be perfect for your customers. It teaches you a method that, when well applied, allows you to design software products that customers really want and pay for when it is launched. This method can avoid the problem of taking the risk of spending a lot of time developing a product that may not have great acceptance in the market. At the time of this writing, this video is still being edited. 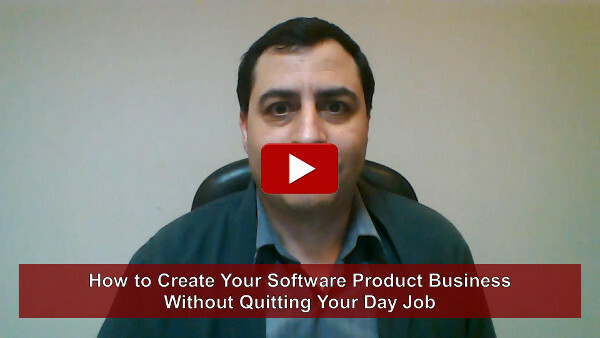 In the page of the video on "How to Create Your Own Software Product Business Without Quitting Your Day Job" there is a link to signup with your Facebook account or signup with your email address, so you can be notified when the new video is ready.